Man of Steel slot is another DC Comics trademarked game like the Batman Series from Playtech's subsidiary, Ash Gaming. If you have not seen the 2013 film Man of Steel, then I will let you know now that this slot is based on this. The hero is Superman in this case and he appears along with various enemies like General Zod and his followers. There are 25 pay lines on a standard 5-reel 3-row grid. There are low-value symbols stacked in pairs while the characters are all single. There are transferring or walking Wilds in the form of Superman and General Zod which all pay 40x stake for 5-of-a-kind as does the Superman logo itself and Zod's 3 soldiers. They can land on any reel and transfer across 1 reel each spin towards the left in the case of Zod and to the right in the case of Superman. As you may have guessed, should they meet on the same row a battle ensues. This triggers unlimited free games where not only Zod but his soldiers are Wilds and any of them may cross paths with Superman Wild which results in Wilds being thrown onto the reels for that spin. The games end when Superman is defeated and disappears from the reels. Should a Krypton symbol land on reel 5 you trigger 7 free spins. These will take place on an expanded game with an extra row and you go up to 50 pay lines. 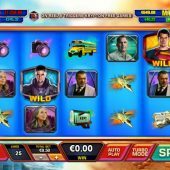 Before these start krypton Wilds will appear on the game grid randomly, up to 10, and remain sticky for the 7 spins which will also have higher-paying symbols present on the reels. You can retrigger them too. You may also see a World Engine symbol on reel 5. If this lands it will blast up to 7 randomly positioned Wilds onto the reels for that spin.